This amazing trilogy of Oliver Schmitt aka Sounds of Revolution is a must have for all Vanguard users! This collection provides you with all the synth tools you’ll need to produce your next dance floor hit. We are convinced it will become one of your main studio tools for refX Vanguard. This compilation includes sounds for modern music genres inspired by today’s top producers! Taking the next step in quality to fulfill all your needs for creating contemporary EDM music. 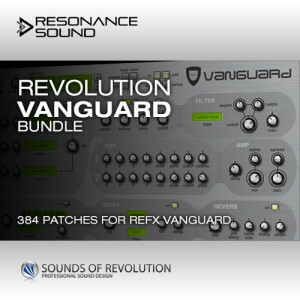 Revolutiuon Vanguard Vol.1-3 Bundle consists 384 patches for ReFX Vanguard inspired by the latest dance tunes! You get: fat basses, energetic leads, pulsating arpeggios, warm/complex pads and breathtaking effect sounds. With skillful and creative synthesizer programming Sounds of Revolution tweaked the Vanguard to it’s limits. Every sound is sorted into categories. Before you buy it: Please note these patches were previously distributed by reFx. No chargeback possible.